Panoramio is a service where users can place photo’s on the map. The service has become even more popular since Google acquired it in 2007 and integrated it with Google Earth and Google Maps. See Panoramio.com for more information. Panoramio Layar is an Augmented Reality layer which is loaded in the popular Layar application, currently available worldwide on Android powered devices and soon available for iPhone as well. Panoramio Layar finds photos which are taken within a certain distance from your current location. It then displays the results as a Reality Layer (in the camera view of your phone), on a map or in list view in the Layar application. How do I install Layar? On Android powered devices: open the Market app and search for layar. Install the application directly on your phone, it’s free! Alternatively, follow the link or use the image as outlined in the next item. How do I access the Panoramio layer? 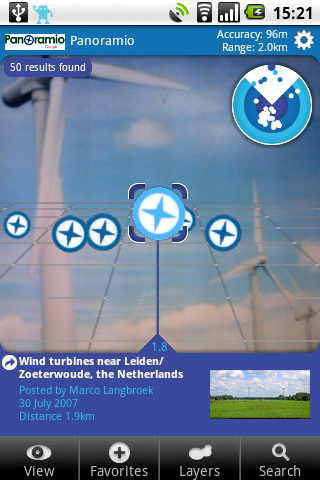 Start the Layar application and open the Layers tab. Now open the Search tab and search for panoramio. If you have not installed Layar yet, you will get a web page with a direct link to the layar app in Android market. Viewing this page from your mobile device? Nice, just click the QR code image to open the Panoramio Layer link. Mobile devices have several means to obtain information about their current location. In ideal circumstances, a built in GPS chip can find its location up to approx. 5 meters accuracy. In dense urban settings or indoors this accuracy is far less, or the system can fall back to using mobile phone transmitters and estimated locations Wifi stations to determine a rough location with an accuracy of hundreds of meters or even worse than a kilometer. I get a “Layer not available” error!? The Panoramio layer plugs directly into the Panoramio API. Layar allows for a 2 second delay between request and response, so if Panoramio is slow with its response, this timeout is may be exceeded. Try to force refresh after a few seconds by selecting the filter options, slightly change the Distance slider and click apply. This forces an update on the Layar server. Panoramio contains millions of photo’s. In order to present you the best results, the photos are sorted by quality and relevance. The outcome of this process is not exactly predictable. In some cases selecting a wider range can decrease the number of nearby results. Cool, can a similar layer be built for my geo-enhanced data? Sure, Layar has opened up their API and you can get started by registering for an API key and get familiar with the API docs on the developer wiki. Alternatively, you can contact me with your ideas and we’ll discuss the possibilities. Please note that this application is not officially endorsed by Panoramio/Google. Squio.nl is not affiliated with Layar, Google or Panoramio.